It’s all over but the shouting. Erm, planning. And, technically, swimming. Whatever: The 4.4-mile Chesapeake Bay Bridge Swim is finally here! I first seriously thought about signing up for the race back in October (see The Contemplation Phase), but I wasn’t sure I really wanted to do it until I realized I stood the chance of not getting chosen in the lottery in November (see Gunning for a BQ). 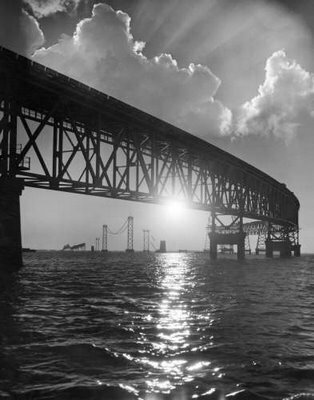 So I pinned a printout of my favorite A. Aubrey Bodine photo of the bridge to my motivation board, and started training. This gorgeous A. Aubrey Bodine photo has hung on my motivation board all winter. Over the past several months, I’ve resisted training, thanks to my long-standing roller-coaster relationship with swimming (see How Swimming and I are like Ross and Rachel). But I’ve also embraced long swims of up to 7,000 meters, and have kind of fallen in love with swimming again, having realized that meditation and inner stillness are somehow easier for me while immersed in chlorinated water. 10:30 a.m.: Pre-race meeting starts. I’ll be posting updates to my Twitter page before and after the race. Until then … wish me luck! Good Luck!!!! You are going to do great! a) i so agree on meditation and inner stillness – it’s there in swimming and not anywhere else, for me and b) i am SO excited for you! can’t wait to hear about it! Hi Amy! This is my first time doing the race too, and reading your blog has gotten me more excited for it. Although…I am also still kind of dreading it and can’t wait for it to be over 🙂 Good luck on Sunday! Glad you found the blog, and that it helped psych you up for Sunday! I am wearing a wetsuit, both for the buoyancy and the cold-protection (even with 75-degree water at Thomas Point, I get cold easily when the water’s cooler than body temperature). But I certainly don’t think you need one, especially if you don’t have one that fits well. Good luck, either way—see you at Hemingway’s! Good luck! It’ll be so fun and a huge accomplishment! Good luck! I can’t wait to hear about how it goes. My first comments online to anything! Ever! That’s what “the tapper” does. You stop and change everything you have been doing for the last 6 months?!? THE LOGISTICS – Where do I park? THE SCHEDULE – Should I eat, 11-2 is lunch time. LUCK – What’s the tempature of the water and this year I staying in the exact middle between the spans. DREAD – I never stay in the middle and have I really preparded enough. EXCITED – ACCOMPLISHMENAT – MEDITATION – Live in the moment and enjoy! This CRACKED ME UP! So glad to know I had a kindred spirit out there … and I see what you mean about staying exactly in the middle of the spans (mile 2, anyone? whew!). Hope it was a great race for you!